Fled fighting in north-west Pakistan. BBC. 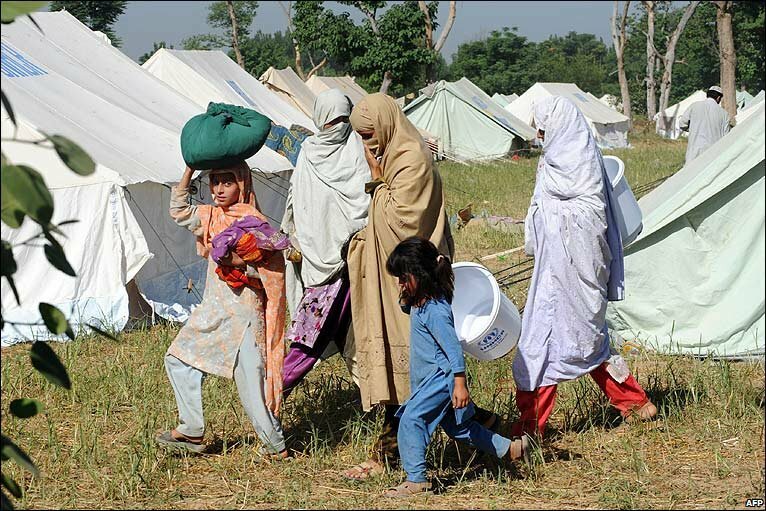 Women and children who fled fighting in north-west Pakistan carry their belongings through a camp for internally displaced people in Mardan. Police in Luxembourg block the entrance to the headquarters of ArcelorMittal. BBC. Police in Luxembourg block the entrance to the headquarters of ArcelorMittal, the world’s biggest steel maker, as employees try to force their way into the shareholders’ annual general meeting. 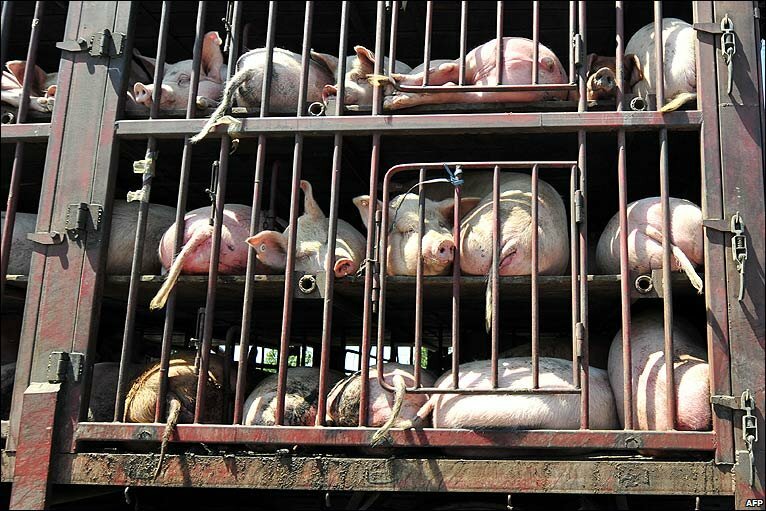 Pigs is transported through Beijing, China. BBC. A lorry load of pigs is transported through Beijing, China, where pork is the meat of choice for most of the population. 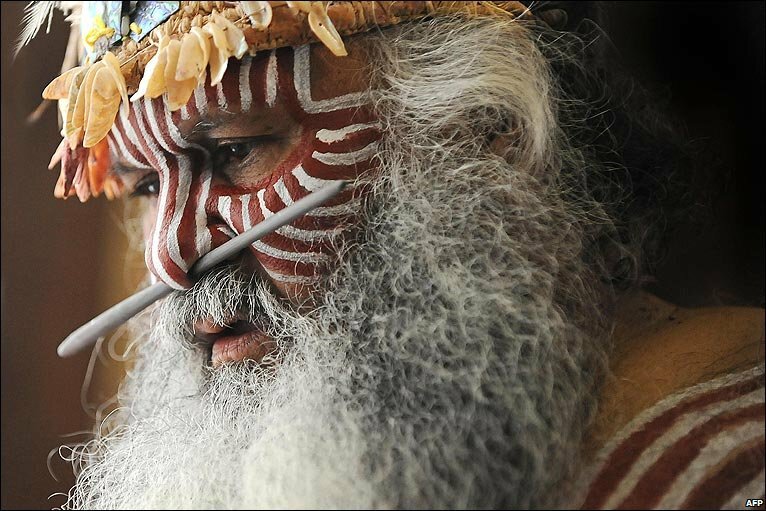 accompany the repatriation of some of his ancestors’ remains from London. Ploughing Ceremony in Cambodia. BBC. 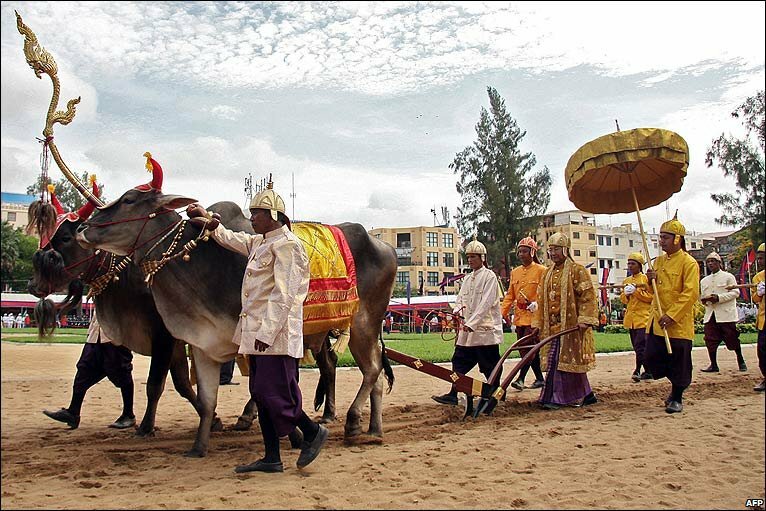 Cambodian officials take part in the ancient annual ploughing ceremony, in which the country’s royal oxen predict the agricultural yield for the coming year. Thai Prime Minister Abhisit Vejjajiva (C) addresses a press conference at the Government House in Bangkok on April 24, 2009. Thai Premier Abhisit Vejjajiva lifted a nearly two-week-old state of emergency imposed in Bangkok amid violent protests, but the government said some troops would remain on the streets. ปรับปรุงจาก ข่าว และ ภาพ ของ สำนักข่าว ASTV ผู้จัดการออนไลน์ 21 เมษายน 2552 18:44 น. พิมพ์ ข่าวนี้ ตร.ยัน “เจ๊เพ็ญ” เปิดตูดเผ่นออกนอกประเทศแล้ว! Former Thai Prime Minister Thaksin Shinawatra gives a live address via a tele-conference to supporters during a rally outside the Government House in Bangkok March 27, 2009. Thousands of anti-government protesters stopped Thai Prime Minister Abhisit Vejjajiva from entering his office on Friday and vowed to continue their siege until he stepped down. Ousted Thai Prime Minister Thaksin Shinawatra gives a live address via teleconference to supporters during a rally outside the Government House in Bangkok March 30, 2009. Last week Thailand descended into chaos as tens of thousands of protesters surrounded parliament in a bid to drive out the government it accuses of being puppets of former Prime Minister Thaksin Shinawatra. Since he was ousted in a bloodless coup in 2006, his UK visa has been revoked, his wife has divorced him and a controversial two-year jail sentence for corruption awaits him in his home country. In his first interview in 18 months, he speaks to Arabian Business. If Thaksin Shinawatra is feeling the heat, then he’s not showing it. Thailand has an arrest warrant out for its former prime minister. The UK has just revoked his visa, and some Western countries are distancing themselves from the man they once championed as their greatest ally in Asia. And yet all Shinawatra can do is shrug. One such place is Dubai, where Shinawatra is resting comfortably in one of the emirate’s top five-star hotels. He might feel entitled to a break, too, as it has been a busy 2008 for the man first nominated to Thailand’s top office in a landslide election victory in 2001. Two years ago he was overthrown in a bloodless coup while visiting the UN in New York. Exiled after months of massive anti-government protests, he ended up in the UK, where he bought Premier League football club Manchester City. After the 2007 election, in which his new People Power Party won a healthy majority, and the forming of a new democratic government by his allies, Shinawatra returned in early 2008 to face his corruption charges in legal courts. However, he and his wife skipped bail – they were convicted in absentia, and a lengthy stay in a Bangkok jail awaits them if they return. The UK froze his reputed $4bn of assets, forcing him to sell Manchester City to Abu Dhabi’s Sheikh Mansour. To add to his troubles, his UK visa was revoked – oh, and his wife divorced him last week. “It’s been a busy few months,” he says, laughing at his own predicament. And it’s about to get even busier, as Shinawatra reveals he intends to make a comeback in politics, tackle global poverty, reorganise the Middle East’s healthcare system – and while he’s at it, establish a sizeable foundation to look after Asians hit by the financial crisis. The really tricky one on the above ‘Shinawatra to-do list’ is return to politics. On October 21, 2008, five members of a nine-member special bench of the Supreme Court found him guilty of a conflict of interest and sentenced him to two years in jail. The judges found that Shinawatra had ultimate oversight over the Financial Institutions Development Fund, a government-run agency that bought up bank collateral and mortgages. Shinawatra’s wife won a competitive auction for a piece of land owned by the FIDF in 2003, and the judges found that his wife’s purchase of the land was done on his behalf, thus constituting a conflict of interest. Given the two-year jail term that awaits him upon his his return – not to mention a long list of political enemies who would like to see the back of him for good – a return to his homeland doesn’t sound like the wisest move. “I have no choice,” he insists. “In the beginning after I was ousted, my wife asked me not to go back to politics. She didn’t like politics, and the whole family went through a lot of hardship so I didn’t go back. “But now I have been cornered because the country is going down deeply,” he continues. “The confidence is not there; the trust among the foreign community is not there; the poor people in rural areas are in difficulty. What does his wife think about this? “She has divorced me,” he responds, bluntly – end of subject. He admits that going back now would be too risky, but insists that “time is on my side”. Last week tens of thousands of anti-government protesters marched on Thailand’s parliament. The protesters, from the People’s Alliance for Democracy (PAD) blocked all streets leading to parliament and besieged other state buildings, forcing MPs to cancel their business, in response to a grenade attack on the protester’s camp that killed one of their supporters earlier this month. Violence flared and as Arabian Business went to press, the head of Thailand’s army had asked the government to dissolve parliament and call new elections – circumstances hardly conducive to a return for the former prime minister. “I can stay here and do some business, enjoy life a bit. But I have to go back for my people and my supporters, most of whom are poor or middle class,” he says. But could he really be PM again? Shinawatra is adamant that it could happen. “The coup is still there – it has been transformed from a military coup to a judicial coup,” he explains. “I think a lot depends on the power of the people – if they feel they are in hardship and they need me to help them, I will go back. The poor have no choice but to live in a capitalist economy, but they have no capital. They have no access to it. If you give them that access, it changes everything. Today Shinawatra is in the Gulf rekindling close friendships with business and political leaders in the region. He said he has been made to feel very welcome, unlike in the UK, where many were surprised by the British government’s decision to revoke his visa. Now, he chooses his words carefully, but remains singularly unimpressed at the circumstances of his departure. “I think the UK is a mature democratic country, and they should understand that I am the victim of the coup d’etat,” he maintains. “I am the victim of dictatorship, even though there was a court verdict. “But that is like the fruit on the poisoned tree – the whole tree has been poisoned and I am the fruit. The tree was planted by the military coup,” he says, adding: “England must understand better but unfortunately they are now busy with their own problems so they forgot about democratic values. “I don’t care, though – I thank them because I went there, I bought a football club then sold it and made some money in the process,” he says. “They gave me a place to stay, even though it was short-term. My children went to school there. So what next for Shinawatra? Putting his political problems aside, Shinawatra is focused on tackling poverty in Asia. He speaks passionately about the plight of the poor, and details the measures he took during his reign in Thailand – and how they worked. Top of his agenda is healthcare. During his premiership, Shinawatra wasted no time in introducing a new system of blanket healthcare insurance for the equivalent of just 3 dirhams a month. “At least 18 million poor people can now enjoy full healthcare,” he says proudly. “If they are having a baby they pay just 3 dirhams. For heart surgery, 3 dirhams. I re-managed the whole public health budget and allocated set amounts to every hospital. “We added more equipment and built centres of excellence. Now they can get the same service as anyone else, regardless of how poor they are,” he adds. Shinawatra insists that he would increase the number of family doctors available, and also establish clinics nearer to housing districts, in order to free up hospital resources and make life easier for the 80 percent of patients who do not actually require hospital treatment. As well as improving healthcare services in the emirates, Shinawatra is also putting together his own detailed proposals for tackling poverty on a wider scale. In particular, he wants governments to use their surpluses to create micro-loans for the poor, in the same way that they were pioneered by Nobel Prize winner Muhammad Yunus, in Bangladesh. Thailand’s People Bank, giving the poor small loans at just 2.5 percent, has been a huge success and Shinawatra wants to extend the principle across Asia. In order to achieve this dream, he has launched a new foundation, named ‘Building a Better Future’. Shinawatra insists that the poverty issue is one that has been “misunderstood” in the past. “Most countries are run by veteran politicians who only have experience of politics,” he points out. “What is missing is management. Politics is about power and law – politicians don’t understand how to run an organisation. With so much on his agenda, it is hard to say what the future holds for Thaksin Shinawatra. He expresses deep gratitude to Abu Dhabi’s HH Sheikh Mansour for engineering the takeover of Manchester City, saying he sold a club but gained “a great friend”. Above all, though, he is looking to go home. He makes no apologies, and has no regrets, about the past. bangkok: Thailand’s main international airport remained shut Wednesday after protesters besieged the facility, startling tourists, halting flights and escalating months of simmering political tensions into a full-blown national crisis. The airport raid, carried out Tuesday by men wielding metal rods who pushed past riot police officers, was the climax of three years of intermittent protests that have tarnished thailand’s long-standing image as a freewheeling but stable nation. 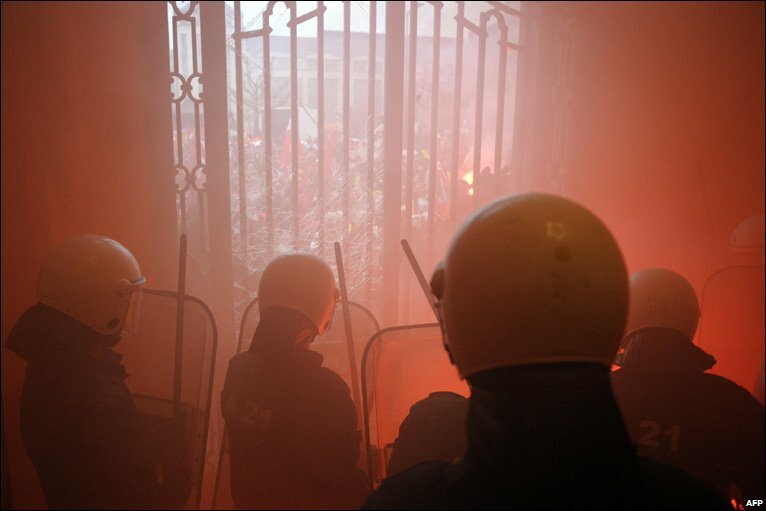 A series of extreme measures by protesters, including a violent clash with government supporters on Tuesday in Bangkok that left 11 people injured, has brought the government near collapse and left Thailand’s democracy teetering. The government has struggled to carry on its business while trying to quell the most recent demonstrations, but has found itself consumed by the stalemate. A sit-in at government offices forced Prime Minister Somchai Wongsawat to conduct business elsewhere. This week, protesters began what they called a final push against the country’s leaders. They prevented one important parliamentary session, and have said they plan to prevent any future sessions or Cabinet meetings, effectively paralyzing the government. The protesters, a loose coalition of royalists, academics and members of the urban elite, say they are frustrated with years of vote-buying and corruption. Many are also skeptical of Thai democracy in its current form and propose a voting system that would lessen the representation of lower-income Thais, whom they say are particularly susceptible to vote-buying. The latest protests come amid anxiety over the health of the ailing 80-year-old King Bhumibol Adulyadej and worries about royal succession. There is also frustration about an underperforming national economy that has not been able to move beyond low-cost manufacturing. The recent protests, like most of those over the past three years, have centered on Thaksin Shinawatra, the former prime minister, who was removed from power two years ago in a military coup. Protesters accuse the current government, and the one before it, of being Thaksin’s proxies. Thaksin was recently convicted in absentia of abuse of power and remains in exile. The current prime minister is Thaksin’s brother-in-law. At the cavernous Suvarnabhumi airport early Wednesday, protesters said they would remain in the facility until the government stepped down. Several explosions were reported early Wednesday outside the airport, injuring at least three people, police said, according to the Associated Press. By shutting down the airport, protesters are ultimately holding the country hostage, analysts say. Suvarnabhumi is the world’s 18th largest airport in terms of passenger traffic. It is the main conduit for tourists and businesspeople arriving in Thailand and is a major transit hub for Southeast Asia. Among the passengers stranded at the airport was Anna Plahn, a 34-year-old from Sweden wrapping up a vacation with her two young children. “My two kids are sick and they want to go home,” she said. On Tuesday, thousands of protesters were camped out on the main entrance ramp to the airport, blocking traffic to the departure terminal. They spread razor wire on the road to limit traffic, which was allowed to trickle through. A truck parked in front of the terminal served as a makeshift stage where a well-known actor, Saranyu Wongkrachang, led the crowd of protesters in song throughout the night. The protesters, who had mainly confined their demonstrations to their sit-in at the government compound, took to the streets Monday, when they forced the cancellation of parliament and temporarily cut electricity supply to the police headquarters. On Tuesday, thousands of protesters kept the government on the run, blocking the entrance to its temporary offices north of the city and massing in front of army headquarters. In the late afternoon a clash erupted between protesters and government supporters. Television showed two protesters shooting handguns in the direction of the government supporters and beating them with metal rods and sticks. There were no reports of deaths on Tuesday. The video also showed protesters surrounding a motorcycle taxi driver and holding a knife to his throat as he clasped his hands together, begging for mercy. Thaksin has many supporters among taxi drivers. It was unclear what happened to the man. With nearly daily protests taking place in Bangkok for the past six months, many Thais have grown frustrated. The print news media, which has been generally critical of the government and supportive of the protests, has recently run articles skeptical of the daily street demonstrations. But the People’s Alliance for Democracy, the group leading the movement to unseat the government, still has a loyal following. The latest spate of protests began in April, but became more serious in August, when the alliance took over the prime minister’s office compound, forcing the previous prime minister to operate out of the VIP terminal of Don Muang Airport, the capital’s older airfield, which is now used exclusively for domestic flights. On Monday, protesters blocked access to the offices at Don Muang. A Cabinet meeting had been planned for Wednesday, but government officials said it might be pushed back. The prime minister was scheduled to return late Wednesday from a trip to Peru, where he attended a summit meeting of Asian and Pacific leaders. As the Thai economy slows down as the global financial crisis causes ripples here, and as the stalemate between the government and the protesters deepens, many Thais are hoping for a resolution. 11 months ago: Crowds of passengers are pictured in the Check In area of the South terminal at Gatwick Airport, in Sussex, in southern England, 10 August 2006. Workers at seven British airports including London’s Heathrow voted Friday 21 December 2007, to stage a series of strikes in January 2008 over pensions in a move which could cause severe disruption. The staff including firefighters will stage 24-hour stoppages on January 7 and January 14 and will strike for 48 hours from January 17. 11 months ago: Travellers wait at Orly Airport as a strike by Air France ground crew over pay issues grounded passengers for the third day, near Paris December 22, 2007. 11 months ago: Passengers wait for informations in Terminal 2 at Orly airport, outside Paris, 21 December 2007 as some 44 percent of Air France flights were cancelled due to a strike by AF ground staff upon calll of two unions CGT and Sud Aerien. 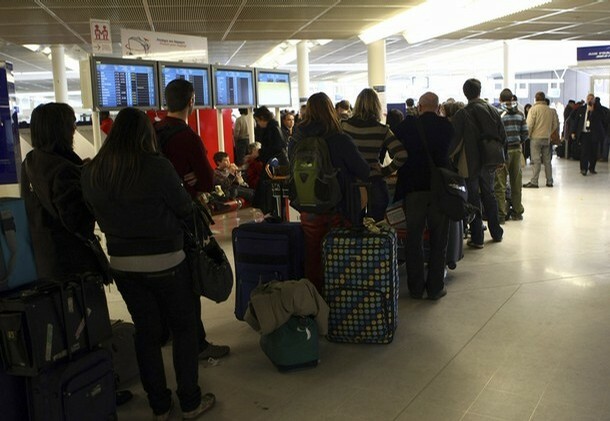 Dozens of flights were delayed and others cancelled, which brought serious inconvenience for Xmas holiday makers. 1 week ago: Alitalia jets are seen in the background at Milan’s Linate airport, Italy, Wednesday, Nov. 12, 2008. Alitalia canceled dozens of flights for a third straight day Wednesday because of labor unrest leaving customers in Italy scrambling for alternative flights or facing long delays. The ailing airline predicted some 50 flights would be canceled as it continued to feel the effect of a wildcat strike on Monday and a work-to-rule protest by pilots over the last few days. 1 week ago: Alitalia jets are seen in the background at Milan's Linate airport, Italy, Wednesday, Nov. 12, 2008. 2 months ago: Alitalia’s air hostesses and employees demonstrate during a strike at Fiumicino airport near Rome on September 17, 2008. Alitalia cancelled 40 flights — half of them international — because of a four-hour strike by a minority union opposed to a rescue deal and Italy’s government summoned all nine unions from Alitalia, as the labour minister said negotiations on a deal to save the flag carrier had reached an end. 2 months ago: Alitalia’s employees demonstrate during a strike at Fiumicino airport near Rome on September 17, 2008. Alitalia cancelled 40 flights — half of them international — because of a four-hour strike by a minority union opposed to a rescue deal and Italy’s government summoned all nine unions from Alitalia, as the labour minister said negotiations on a deal to save the flag carrier had reached an end. 7 months ago: Employees of Atitech, a company responsible for the maintenance of Alitalia planes, demonstrate against planned layoffs in the Air France-KLM proposal to takeover the ailing Italian airline, at Naples’ Capodichino airport, southern Italy, Wednesday, April 2, 2008. Alitalia’s strike-prone unions were meeting Wednesday with the Air France-KLM chairman who is seeking their agreement to keep alive a deal to buy the struggling national carrier. Air France-KLM proposal to takeover the ailing Italian airline, at Naples' Capodichino airport, southern Italy, Wednesday, April 2, 2008. 1. To prevent the rewriting of the 2007 Constitution by the proxy government of ousted premier Thaksin Shinawatra who are trying to amend the charter to whitewash the crimes committed by Thaksin and his cronies and to destroy the country’s judiciary system. The PAD also strives to prevent the proxy government from abolishing the Privy Council, a move which the PAD considers to be a direct violation of His Majesty the King’s authority. The current Thai Parliament is also considered to be under Thaksin’s complete control. It has committed various wrongdoings and violated election laws, yet continues to claim it represents the people of Thailand. But in truth, the proxy Parliament is a sale to any highest bidding politician. The Constitution court’s imminent deliberation of a various party dissolution cases against several of the government coalition partners is proof enough of the fact that Thakin’s proxy government is not a truly ‘constitutional’ government of Thailand. 2. To drive out the killer government that has shamelessly acted as a nominee for fugitive Thaksin Shinawatra. The government is clearly behind the ruthless killings of Thai citizens, manipulated state media, supports the destruction of the Thai judiciary system, exploits the country’s national budget, condones lese majeste actions, lacks any ethical standing and therefore is deemed to be an illegitimate government which is not fit to administer the Kingdom. For the above reasons the People’s Alliance for Democracy has been rallying peacefully and without arms, a right which is sanctioned by the 2007 Constitution Article 63. Article 70 stipulates that a Thai citizen has the responsibilities to protect the 3 pillars of the country; the nation, religion and the King and the nation’s constitutional monarchy. However, during the course of the rally the lives and safety of supporters of the People’s Alliance for Democracy have been in constant jeopardy. The government is also clearly involved in masterminding various violent attacks against the PAD. It has also turned a blind eye when the PAD was attacked with weapons of war on more than 10 occasions. The ruthless attacks have resulted in countless injuries and 4 deaths. Several attacks were also targeted at the ASTV headquarters in an attempt to prevent that station from broadcasting live the PAD rally. The government has yet to take any responsibility for the underhanded sabotage attempts. Three Senate committees, tasked with investigating the violence and bloodshed of the October 7th incident, have found that the PM Somchai Wongsawat and his Cabinet ministers are to be held responsible for the injuries and deaths of the protesters. Their findings coincide with that of the National Human Rights Commission. Premier Somchai must take responsibility for the tragedy by resigning immediately and without any condition. The People’s Alliance for Democracy has called for a final mass rally to stop the traitorous government and proxy Parliament on November 23, 2008 at 2 p.m. The final rally is well into its 50th hour and the supporters of the PAD have been pressuring the traitorous government to step down with peaceful means. Armed with only the plastic hand clappers, the PAD protesters have marched to various key locations including Parliament, Finance ministry, the Metropolitan Police Bureau and the government’s temporary seat at Don Muang Airport. However, to no avail, the proxy government has failed to show any sign of remorse or any intention to step down as demanded by the PAD. In addition, it continues to cling on to power and is determined to amend the charter for the interests of its puppet master and his associates. The People’s Alliance for Democracy is left with no choice but to step up its peaceful rally by blocking off access to the Suvarnabhumi Airport. This is considered to be an ultimatum for Somchai Wongsawat and the Cabinet to resign immediately and without any condition. The people’s alliance apologizes for any inconvenience the closure of the Suvarnabhumi Airport may cause to the public and international visitors to the Kingdom of Thailand. But the PAD believes the measure is crucial to bring an end to the traitorous-killer government. The PAD is calling for the public from all walks of life to join the PAD movement and call for the current administration to resign immediately to protect Thailand from more harm and to restore morals to the Thai society without any further delay. ปรับปรุงจาก ข่าว และ ภาพ ของ สำนักข่าว ASTV ผู้จัดการออนไลน์ 26 พฤศจิกายน 2551 09:08 น. The refinery operator Ineos said that assuming it got power back as soon as the strike ended and Forties fields resumed production rapidly, the pipeline could be back in operation within 24 hours but might take a few more days to get back to full flow. Apr 26 – Fuel shortages hit parts of Scotland as motorists ignore official advice against panic buying. Management at the Grangemouth refinery, owned by international chemical company Ineos, met officials of the UNITE union on Saturday but failed to get a deal that would allow the pipeline to continue operating. External Links Below Use Browser “Back Button” Back to Here..